The Kh-101 / Kh-102 Raduga is relatively new line of conventional and nuclear capable air-launched cruise missiles (ALCM) developed and deployed by Russia. A stealthy missile, the Kh-101/-102 is designed to defeat air defense systems by flying at low, terrain-hugging altitudes to avoid radar systems. The Kh-101 carries a conventional warhead, while the Kh-102 is believed to carry a 250 kt nuclear payload. Since entering service in 2012, the Russian air force has employed the Kh-101 several times in combat operations. Missile Defense Project, "Kh-101 / Kh-102," Missile Threat, Center for Strategic and International Studies, October 26, 2017, last modified June 15, 2018, https://missilethreat.csis.org/missile/kh-101-kh-102/. 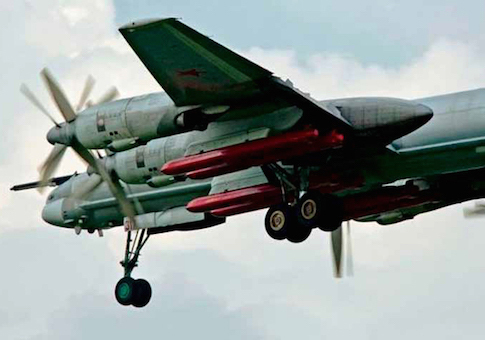 Andrei Akulov, “Russian Kh-101 Air to Surface Cruise Missile: Unique and Formidable,” Strategic Culture, October 19, 2016, https://www.strategic-culture.org/news/2016/10/19/russian-kh-101-air-to-surface-cruise-missile-unique-and-formidable.html. “Kh-101/-102” in IHS Jane’s Weapons: Strategic 2015-2016, ed. James C O’Halloran (United Kingdom: IHS, 2016), 189. Ibid; Russian Ministry of Defense, “Strategic Tu-95MS bombers destroyed the ISIS militants’ command post and storages in Syria with missile attack,” July 5, 2017, http://eng.mil.ru/en/news_page/country/more.htm?id=12132186@egNews. Dave Majumdar, “Ready for War: Russia’s Stealthy Kh-101 Cruise Missile Debuts in Syria,” National Interest, November 18, 2015 http://nationalinterest.org/blog/the-buzz/ready-war-russias-stealthy-kh-101-cruise-missile-debuts-14387; Akulov. “Tactical Missile Corporation plans to upgrade Kh-101 Cruise Missile,” Russian Aviation, August 19, 2016 https://www.ruaviation.com/news/2016/8/19/6541/?h. “Kh-101/-102” in IHS Jane’s Weapons: Strategic 2015-2016, 189. “Kh-65/ Kh-SD/ Kh-101,” Federation of American Scientists, https://fas.org/nuke/guide/russia/bomber/kh-101.htm. RC Porter, “Top-Notch Kh-101 Cruise Missiles that Russia Unleashes on Daesh in Raqqa,” Fortuna’s Corner (blog), February 19, 2017, https://fortunascorner.com/2017/02/19/the-cruise-missiles-russia-is-using-in-syria/; Nicholas de Larrinaga “Russia Launches Long Range Air Sorties into Syria,” IHS Jane’s Defense Weekly, November 17, 2015, https://web.archive.org/web/20151118145706/http://www.janes.com/article/56062/russia-launches-long-range-air-sorties-into-syria. David Cenciotti, “Russia Tu-95 Bear Bombers Escorted by Su-30SM Jets Carry Out Air Strike in Syria using Kh-101 Strategic Cruise Missiles,” The Aviationist, July 5, 2017, https://theaviationist.com/2017/07/05/russian-tu-95-bear-bombers-escorted-by-su-30sm-jets-carry-out-air-strike-in-syria-using-kh-101-strategic-cruise-missile/. “Russia hits Islamic State in Syria with advanced cruise missiles,” Reuters, July 5, 2017 https://www.reuters.com/article/us-mideast-crisis-syria-russia-idUSKBN19Q1QP. Russian Ministry of Defense, “Tu-95MS bombers fired cruise missiles at terrorist objects’ in Syria,” September 26, 2017, http://eng.mil.ru/en/news_page/country/more.htm?id=12143592@egNews.